Dec 1, 2016 | eNews Etc. November 19 is a historic day for all bhikshunis in the world. 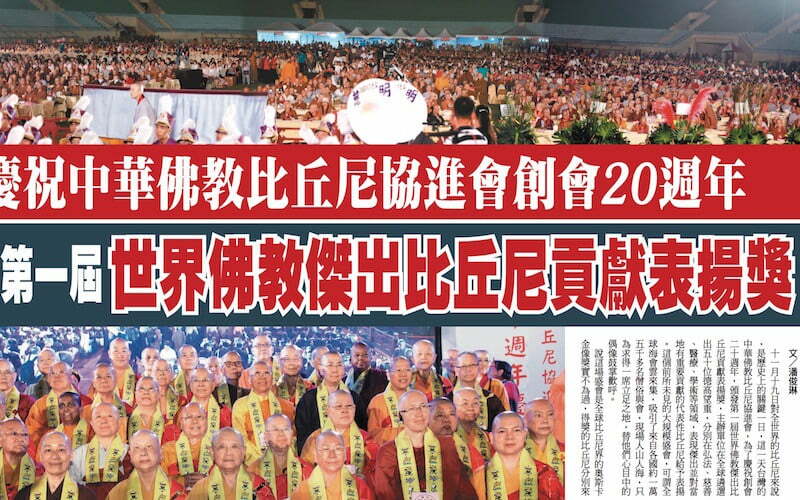 On this day, Taiwan’s Chinese Buddhist Bhikshuni Association, in order to celebrate the 20th anniversary of the founding of the Association, presented the first Global Awards for Outstanding Contributions of Commended Bhikshunis. The organizers recognized 50 highly respected bhikshunis in the world based on their outstanding contributions in spreading the Dharma, charity work, medicine, academia and other fields, and their important contributions to their local communities. This unprecedented large-scale event might be likened to a gathering of oceans and clouds of bodhisattvas from around the world, attracting more than 15,000 monastics and lay people. The venue was packed with a huge crowd of people each seeking a place so that they could cheer and applaud their role models. It’s not an exaggeration to describe this event as the Academy Awards for global bhikshunis. The bhikshunis who received the award came from South Korea, the United States, Sri Lanka, China, Thailand, Singapore, Cambodia, Canada, the United Kingdom, Malaysia, Austria and Taiwan, a total of 50 recipients. In order to select the 50 outstanding bhikshunis, the organizers made multiple overseas expeditions to inquire about the beneficial work of these nuns, and finally identified these 50 outstanding bhikshunis. It would not be an overstatement to say that this award ceremony is a pivotal occasion to give recognition to all Buddhist nuns in the world, more than 2000 years after the Buddha agreed to ordain Bhikshuni Mahaprajapati. The opening ceremony started with a performance by the marching band of Tai Zhong’s Ci Ming High School, leading VIPs and awardees to take their seats on stage, adding a youthful atmosphere to a dignified ceremony. The Chairperson, Venerable Master Bhikshuni Pu Hui; Vice Chairpersons, Venerable Master Bhikshuni Da Ying and Hong An; the previous Chairpersons (2nd and 3rd) Venerable Master Bhikshuni Shao Hong, President of the World Chinese Buddhist Sangha Congress and Venerable Master Jing Xin, Chairman of the Buddhist Association of the Republic of China; Venerable Master Zong Zhang, President of the Los Angeles Buddhist Union; Venerable Master Zhao Chu, The Abbot of Nyingma Palyul Namdroling Monastery, South India; and Gyang Khang Khentrul Rinpoche jointly set in motion a rotating earth structure which symbolized the unity of the Buddhist community, following which colored ribbons were released in the air. The ceremony started off with a big bang. Chairperson of the Chinese Buddhist Bhikshuni Association and Chairperson of the organizing committee, Venerable Master Bhikshuni Pu Hui said that on behalf of all the members of the Chinese Buddhist Bhikshuni Association, she expressed the most sincere welcome to the distinguished guests, the awardees and the audience. As a bhikshuni, she was grateful to Ananda for requesting the Buddha to kindly allow women to have the opportunity to ordain and practice the Buddhadharma. As a result, Buddhist history was marked with a new chapter of the bhikshuni lineage that continues to this day. The status of bhikshunis in Buddhism has always come under historical and circumstantial pressure, but many senior nuns with faith and conviction have worked quietly to spread the Dharma and uphold Buddhism with their minds set firmly in the right view, never turning back in discouragement. “There must be many bhikshunis around the world who are upholding the spirit of the Buddha, working for the benefit of Buddhism and sentient beings without seeking recognition. For the recipients, this award is well-deserved. For all bhikshunis around the world, the road to come is long and there is much to be done. Hopefully this award will inspire a sense of honor in your heart and turn this glory into the spirit and strength to continue spreading the Dharma, spreading the seeds of Buddhism globally, to develop future pillars of the Dharma who can continue to carry on the Buddhist tradition, and spread the wisdom of Buddha’s teachings”. President of the World Chinese Buddhist Sangha Congress, Venerable Master Jing Xin, said that this meaningful award is unprecedented in the Buddhist world. “The accomplishment of this noble enterprise is due to the skillful leadership of the chairperson, and only made possible by the excellent planning and execution by secretary-general Venerable Jian Ying. 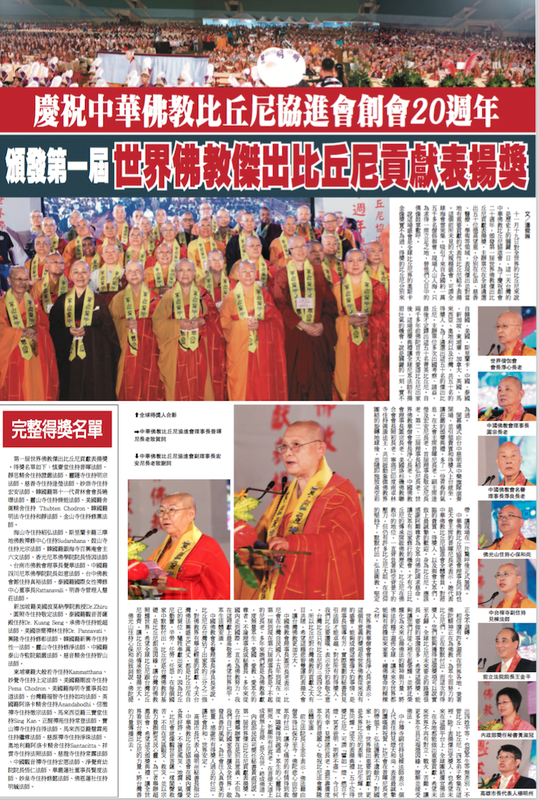 To all the award recipients, the bhikshus give praise with the utmost respect.” He pointed out that the bhikshus are only one third or a quarter of the number of bhikshunis in Taiwan, so the contribution of bhikshunis to Buddhism in Taiwan is obvious to all. He hoped that this award ceremony that is based on compassion and wisdom will enhance the brilliance of Buddhism in Taiwan. Chairman of the Chinese Buddhist Association of the Republic of China, Venerable Master Yuan Zhong said that the Chinese Buddhist Bhikshuni Association has existed since the 85th year of the Taiwan Republic of China (1996) and the first to the present sixth Chairperson have all been extraordinary bhikshunis. Over the years, these respected elders have made dedicated contributions to Buddhism, benefited countless sentient beings, loved their country, loved to teach, and loved living beings. Both the chairperson and secretary-general have put in great effort for Buddhism throughout the years starting from within the country and extending to the international level. He offered them the highest respect, prayed for world peace. and for all sentient beings to have good health. 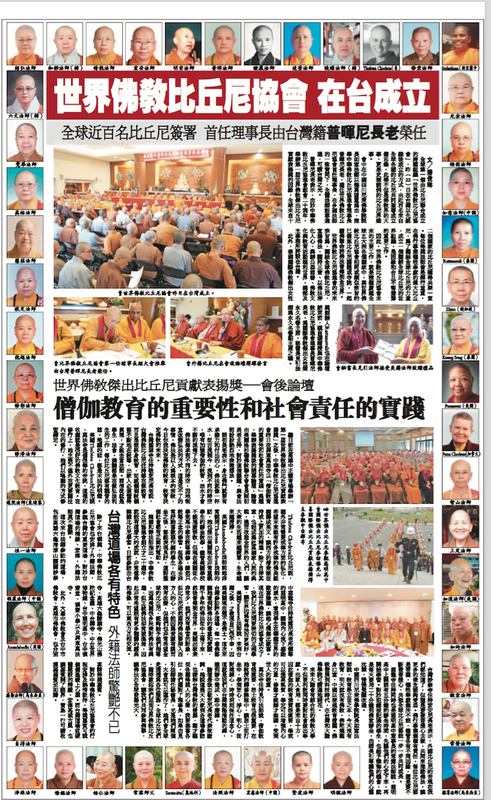 The honorary president of the Buddhist Association of the Republic of China, Venerable Master Jing Liang, said that the bhikshunis in Taiwan account for two-thirds of the monastic community, and thus are vital contributors to the Buddhist world. “The glorious flourishing of Buddhism in Taiwan today is due to the bhikshunis’ sacrifice and dedication in their various roles. Bhikshunis are the foundation of Taiwanese Buddhism through their diligence, hard work, ability to bear hardship without complaints and their quiet contributions in different countries. They have created the cause for Taiwanese Buddhism to shine brightly in the world.”. He hoped that bhikshunis around the world will emulate the Taiwanese bhikshunis to bring the bhikshuni lineage to greater heights. Abbot of Fo Guang Shan, Venerable Master Xin Bao, said that the Buddha had proposed equality of the four castes and taught that there was no difference among sentient beings. He urged all those present – regardless of whether they were bhikhus, bhikunis or the four-fold sangha – to not only recognize the outstanding awardees, but also to use this platform in the future to work in global unity to spread the Dharma widely and make important contributions in every part of the world. Through this, he hoped that the world in the future would be free from conflicts, wars and suffering, and that many more sentient beings would accumulate the virtues and causes to be able to understand and accept the Dharma. Vice-Abbot of the Zhong Tai Chan Temple, Venerable Master Jian Dong represented her Abbot, Venerable Master Bhikshu Jian Deng, to express the most sincere praise and congratulations. “The Chinese Buddhist Bhikshuni Association, under the leadership of Venerable Master Bhikshuni Pu Hui , spared no effort to spread and protect the Dharma, making tremendous contributions to the country, society, and the world. They set an example for all bhikshunis around the world, illuminate the bhikshuni lineage. and bring light to the world. This award ceremony and the 50 outstanding bhikshunis can be described as being ‘like a lamp that ignites a hundred thousand lamps, illuminating all darkness with an illumination that is never exhausted. '” She said that she felt fortunate to bear witness to the bodhi heart of the elders today, and wished the Association every success and everyone good health. Former President of the Legislative Yuan, Wang Jin Ping, said that the Dharma had been preserved to date due to the Sangha’s contribution. “Through the Buddha’s compassion manifested in the actions of the Sangha, the physical and emotional suffering of sentient beings has been alleviated, obstacles have been overcome, and the hearts of sentient beings have been illuminated” He prayed that all the bhikshuni elders along the bodhi path achieve supreme bodhi, live a long life, and eventually became Buddhas. Senior Secretary of the Department of Civil Affairs of the Ministry of the Interior, Huang Shu Guan, said that it was especially significant that the first Global Awards for Outstanding Contributions of Commended Bhukshunis was being held in Taiwan. The awards served to inspire kindness and bring the force of truth, goodness and beauty into society, not only within the country but even extending to the world. She thanked all the awardees for their past contributions to bring about social harmony and stability in the world. Buddhist Bhikshuni Association is widely praised within Taiwan, for responding spontaneously, just like the Bodhisattva Guan Yin, to the sufferings brought on by disasters, whether it is a storm, earthquake, or gas explosion. The Association provides disaster relief, aids, and soothes the hearts of the victims through the power of religion as well as pray for the deceased. He hoped that this awards ceremony will let the world see the strength of Taiwanese bhikshunis and help to spread Taiwan’s positive energy afar.